I love the comforter. It's very warm and soft to use as a winter bedspread. It's hard to get out of bed because it's so cozy. I don't care for the shams as much, but they're nice if you want the matching pillows. Warm up with this cozy bedding set from Gracewood Hollow. The plush grey comforter features a pintuck pattern that you can admire while enjoying the sherpa-lined reverse side. This set includes two matching shams to accent the comforter and crisp white sheets and pillowcases for a contemporary look. Love this comforter. It is so soft, inside and out, probably the softest bedding I have ever owned. Warm rating about a medium, keeps me warm but not on very cold nights when it drops down to the low 30's & 20's. The style is gorgeous, the pintucks with the velvet look really stands out. I got the silver, it is a soft dove grey color with a little shimmer to it. Haven't washed it yet so don't know how that will do. I have cats and a dog so I have a throw I put on it before the animals get on it to go to bed. I have noticed some pulled thread already from the animals though, so I would classify this as somewhat delicate, be careful if you have pets. Size wise I can't say, I usually get a king size for a queen bed because I like longer bedding and that is what I did here. I am a little surprised at the reviews that this comforter is getting. It is thin...I mean really thin. It feels exactly like the cheap fur blankets you can get at a big box store. One pillow sham fit well and the other was baggie on my pillow. Also, the gathered areas do not gather or pleat because it is so thin. Instead it looks like a flat comforter with flowers on it. I hope this helps. I love it. Its so soft and not to heavy. The sheets fit my 15 inch corner son my king bed perfectly. I have to be honest, when I initially received the comforter I was a bit disappointed. When I put it on my bed, I thought it's too lightweight, it's too soft, it can't be warm. Don't judge a book by the cover. First off, the outside is so luxurious and soft. I refer to it as heaven. The sherpa lining although it's not heavy, is absolutely perfect. This is the coziest comforter I have ever owned. It keeps me warm without being heavy. I could live in my bed. 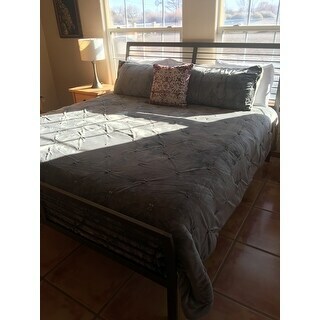 It's also a perfect king size, enough coverage that it hangs perfectly on both sides of the bed. You will need to have it cleaned at a facility that has an oversized washer and dryer. Do not even attempt washing this at home. It is like a little piece of heaven on my bed. It is so soft and comfortable, I drift right to sleep after laying down in my bed. That is saying a lot, because it normally is not easy for me to fall asleep once I get into bed. It is the perfect weight too. It is heavy enough for winter, but still light enough you won't get too hot in summer. The color and look to it is as shown. Bedding is soooo soft! I absolutely love the feel and it provides a great deal of warmth. The only draw back is that it is not nearly as fluffy as pictured. I ended up having to buy a plain white down comforter to go undeneath to get the desired look I was going for. Other than that I literally had to fight off my teenage girls who tried to take it from me for their rooms. I ordered a king and it was plenty but without being too large it looked ridiculous. The shams were also great and fit king sized pillow quite well. Definitely recommend this...you are in the fence, just get it! It's great!! This is a decent comforter. Looks a little cheap to me for the price I paid for this. 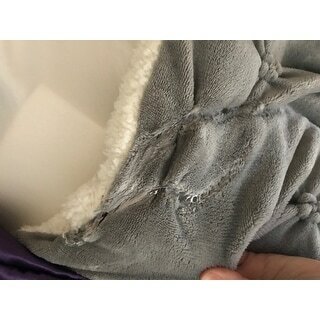 I have many regular Sherpa blankets that are way better quality than this and I’ve only paid 9 dollars each for them, but they don’t cover my entire bed. I have a cal king and ordered the king. It covers it ok, but wish it was a tad larger. For those who are wondering about washing this, I washed it before I used it in my front load washer on comforter cycle, and it came out fine. I was worried it wouldn’t drain, but it did. If you have a smaller topload washer, I reccomend taking it to a laundermat to use the larger machines. I ordered a queen size for my son, unfortunately he had just purchased a comforter. Although, we have a King, my husband and I loved it so much we decided to keep it and use as a blanket. We sometimes had trouble sleeping but now we sleep like babies. It feels so warm, cozy and luxurious. I've just ordered a king for us and putting the queen in our guest room. The sheets are great too. This is definitely value for your money. Love the sherpa lining, nice and cozy on these 20 degree mornings. Great price for a 7 piece set. I bought the gray set to stay on trend and the color goes with everything. Generous size quilt, shams are a little small, but we added some throw pillows and 2 larger pillows behind the gray shams for a fantastic finished look! Super comfy and gorgeous. HOWEVER, after washing it for the first time following the directions on the tag, the comforter started coming apart. There is a glue-like substance coming out of the stitching and it is ripping where the stitching is. Now the comforter is scratchy and uncomfortable in those areas. Super disappointed about this considering how soft it was before I washed it. I couldn't be more pleased with this set. This is a Great comforter and very soft and looks great would totally buy again. It's so comfortable! The only thing is that the comforter does feel kind of cheap , almost like a throw blanket rather than a comforter and the white part can easily be dirtied and the way it feels I can tell if you were to wash it it would change the feel of it . Very very warm and cozy comforter but I was going for a high end look in my master bedroom and this doesn't have that luxe look in person. Did not think the quality of this product was good. Had a lot of strings hanging and doesn't look as nice as the picture. I love this comforter. It is so warm and comfortable and easy to wash in the washing machine. Unfortunately, the top fabric pulls easily and my cat keeps putting pulls in it. However, for the price, I would definitely buy another one. This really wasn’t what I was expecting. I ended up buying another comforter to go on the bed and folded this one at the end of the bed. My daughter in law loved it because it was is so soft. I would say this became her blanket like a throw blanket than a comforter. It is cute though. Perfect, beautiful and cozy - great price too! This comforter was very pretty. Soft and super warm. I'm not fond of the sherpa lining as everything sticks to it. It was little too warm for Louisiana weather, so I had to return it. Very nice set. Lasting well with frequent washing hasn’t faded and are not becoming itchy. Comforter is like a dream, so soft and really keeps you warm. No shedding. This set is so soft and warm! Perfect for winter, this might even be too warm. Looks so elegant in my room. The only con I can think of is that it could be a tad more long for it to drape a little more on the sides. Other than that I never want to leave my bed. Super soft, super warm! Only thing I don't like is after I washed it, the underside of the blacket got ruffled and itchy. I suggest washing with a fabric softner. "Is King size good for California King bed?" although I don't have a California king, I have a high rise pillow top & it does hang comfortably on either side. I am guessing it would work for a California king. The comforter is amazing & washes up nice. The sheets that come w/ it, not so much. They are see through, but I do recommend the comforter! The dimension of this item is 86 x 92 inches. 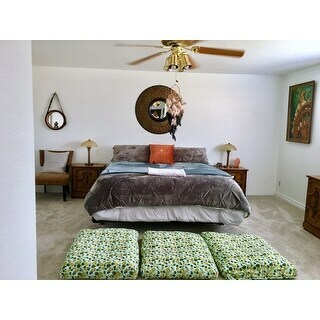 Therefore it is good for a California King Bed (72 in x 84 in). "I would like to know when a queen size would be available please? " "When will a king size be available?" Unfortunately, we do not have a re-stock date for this item at this time. We apologize for any inconvenience. "what color are the sheets that come with this?" I purchased this product because I appreciate the uniqueness of the fabric and design. "Will the king fit a Cal king?" Hello Big Ang, this will fit a standard king size, we cannot guarantee that it will fit a California King as it is smaller in size than a California King. Thanks for shopping with us! "I have a standard queen bed, if I order a king size will it fit like in the picture or will it drag?" Hello , it will vary from the mattress height being used. Please verify the measurements to have a better visual of this item will hang on your bed. Please feel free to contact us again with any further questions. Thank you for shopping with us!